Robert LaValva, the founder of the New Amsterdam Market, wants to do more than sell local vegetables. He hopes to change the way America, and eventually the world, shops for food. Or rather, he wants to change us back -- to the 19th century, before industrial food production and chain supermarkets. 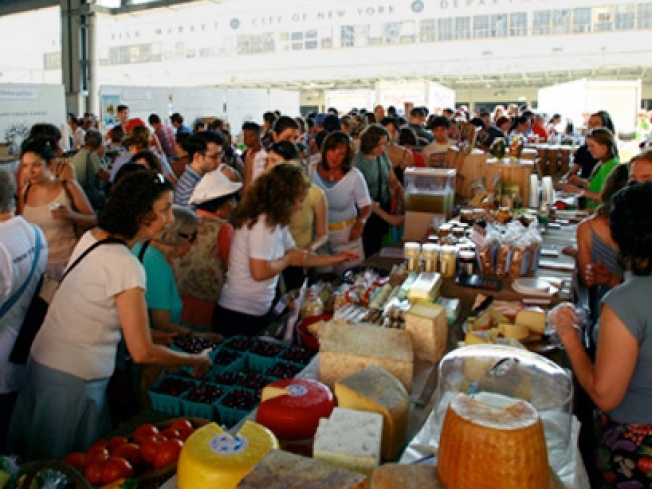 The New Amsterdam Market, which brings together local purveyors and producers of everything from cheese, meat and pickles to organic chili and ice cream (In its Best Of issue, New York Magazine called it a "phenomenon... combining the Greenmarket’s commendable focus on small local farms with the artisan-incubating spirit of the Brooklyn Flea, [and] the civic-minded aims of Essex Street Market"), is kicking off its 2010 season on Sunday, June 27 -- but it is currently scheduled to gather only once a month during the summer and every Sunday from September to December. Yet LaValva cites 365-day operations like Seattle's Pike Place Market and London's Borough Market as inspirations for the New Amsterdam and he has gained support from local politicians like Christine Quinn, who sees the Market as an essential part of revitalizing the South Street Seaport -- where the market is currently held. LaValva hopes to eventually move the market into the stalls of the former Fulton Fish Market. "I really think the public deserves to see and experience these buildings as market buildings - the public does own them, after all," LaValva told the SoHo Journal. "There have been public food markets on the East River shoreline since 1642, when Pearl Street was paved in oyster shells and New York was still called New Amsterdam... this is the meaning of something 'authentic.'" A year-round indoor shopping destination is the Market's long-term goal, and to help make that happen they are holding a fundraiser on Saturday, May 22 at the historic Marble Cemetery in the East Village. A meager $35 will get you in the gate for a sampling of Market purveyors like Saxelby's Cheesemongers, Marlow and Daughters, Kombucha Brooklyn and The Bent Spoon -- a maker of ice cream and other sweet goods based in Princeton, N.J.
East Village neighborhood beer bars D.B.A. and Jimmy's No. 43 are bringing the kegs and North Fork wines will be represented by Long Island producer, Premium Wines. So buy your tickets, stop by the cemetery for a house-cured ham sandwich and let's get the New Amsterdam Market open for business already.